Several folks have asked about replacement filler tubes for their damaged RJ (and other 1 3/4 inch threaded filler tube necks. Here is a source for them . I have two that I ordered last summer but have not placed on the tanks yet. I will be having an expert welder friend do this work for me. 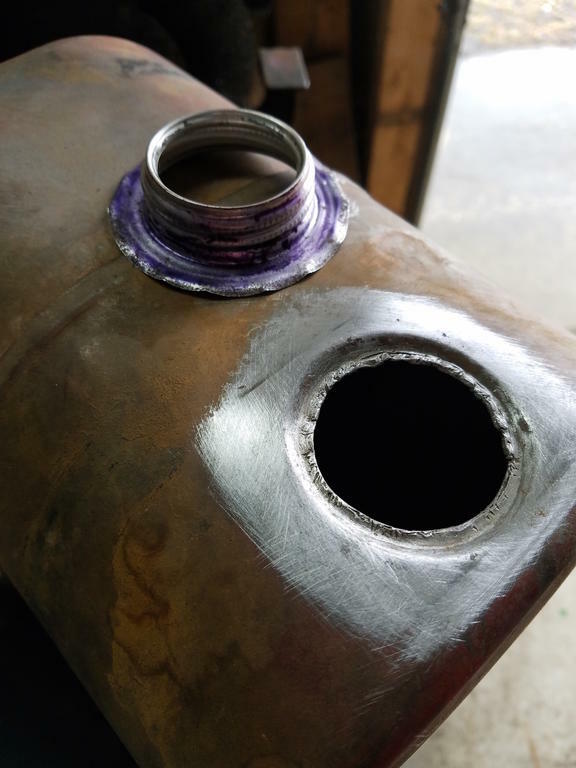 I can;t say if welding, brazing or some other technique is best for replaement but these filler tubes are the right size. NOTE: The lenght of the tube is longer than the original RJ gas tank neck. So it possibly could be raised higher or set to original depth. I thought that some filler tubes were soldered in.? I contacted them last year about this. 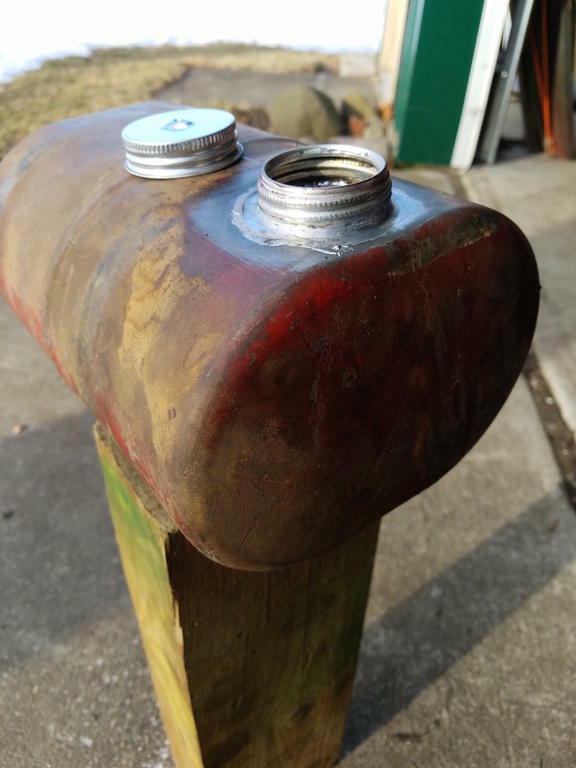 I suggested that there’s a market out there for the rolled threaded filler necks and caps used on many old lawnmower/garden tractor gas tanks. Maybe if they were to get more requests they’d start producing them. There is actually someone out there that makes the correct neck. It is a supplier of hit&miss engine parts. I will look for the information and post it. ^^^ This is exactly what I am looking for. I have done 3 of them. They were soldered and that is how I did the replacements.It was relatively simple and all three wee successful on the first try with no leaks. The fact that the replacements I found were the exact size made it also easy. It may take me a while to find it. I kind of found it by accident a couple of years ago. It was basically a simple website with a PDF list on it. Seems run by a single guy. I called in the order and when received you send him the payment (Incredible now a days). With the order he sent me a small catalogue that I know it is here somewhere. Having said all of that, I bought 6 necks and caps. I used 3 necks and all of the caps. I have 3 necks left. Haven't had a need for them since . I like to have these things around that is why I never get one of anything, however if any one is desperate for them (I know that when you need this there is nothing else that will fix it) I am willing to part with them. There will be no charge, they were ridiculously inexpensive. First come first serve basis of course.One per call so others can save their tanks. Having said all of that, I bought 6 necks and caps. I used 3 necks and all of the caps. I have 3 necks left. Haven't had a need for them since . I like to have these things around that is why I never get one of anything, however if any one is desperate for them (I know that when you need this there is nothing else that will fix it) I am willing to part with them. There will be no charge, they were ridiculously inexpensive. First come first serve basis of course. Is this the place your thinking of? http://www.hitnmiss.com/31.html The filler necks are on the bottom of the page. While looking now I came across this one too. However it is not this one.Site had only basically a PDF sheet and had photos on it so I immediately recognized I was looking at the right thing. 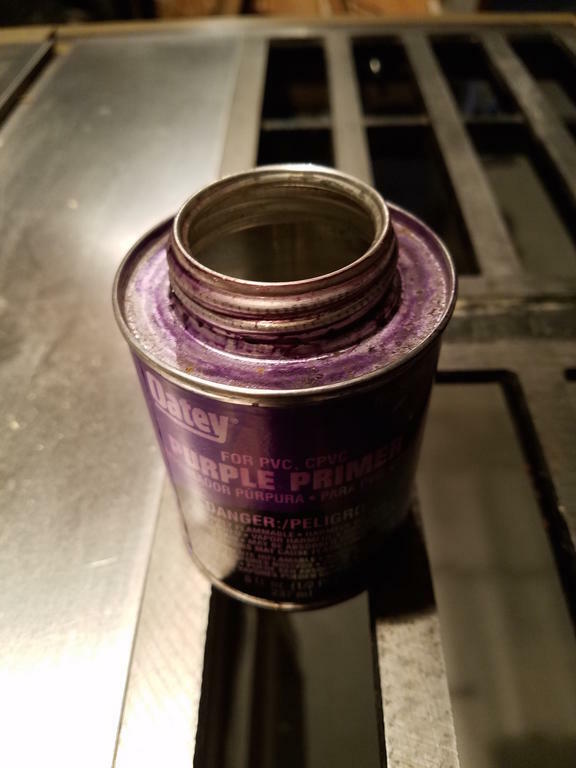 I ended up doing some investigation and found the lid of a PVC primer can is the identical opening that is on my RJ gas tank. I soldered it on and it works perfectly. 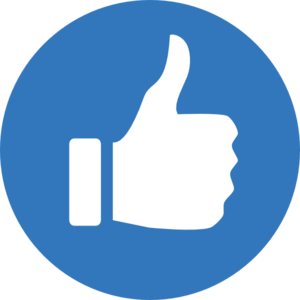 Very good information MoreyToo and Formariz! Yeah real good info there fellas. 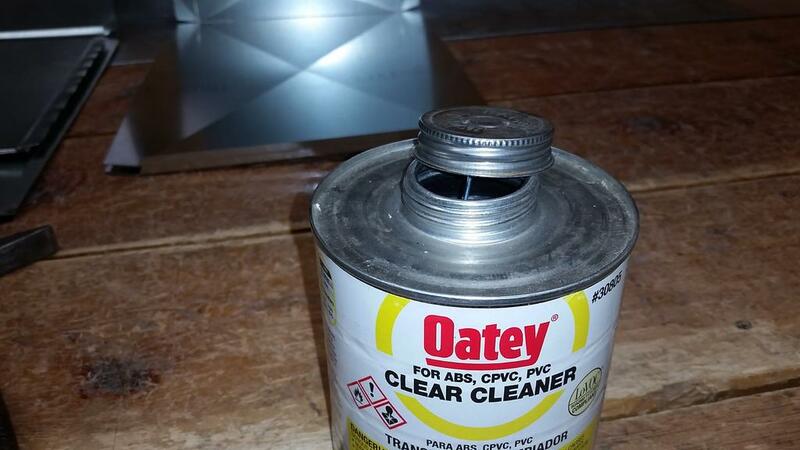 I go through a alot of these cans. They are a tad short tho. Let me know if there's a need for them I will start hoarding empties! There you go. Very clever. Like they say necessity is the mother of invention. Here is the final product. 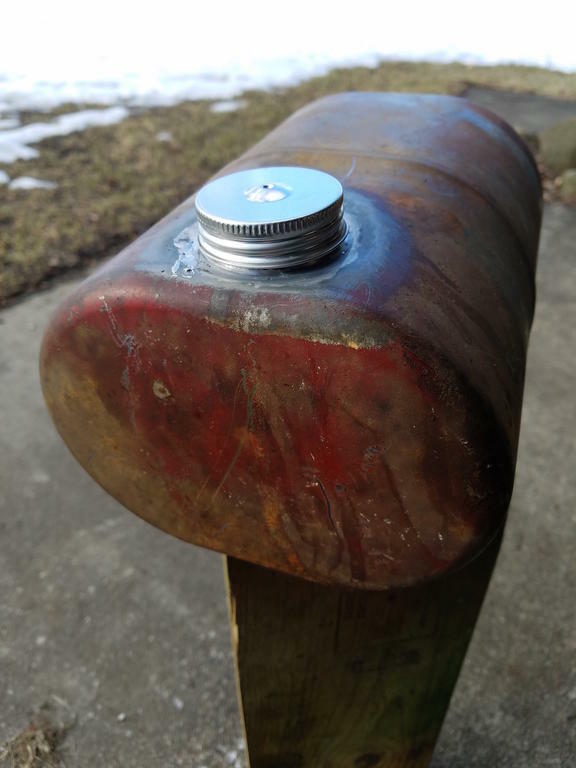 Did you trim the flange to fit in recess? Yes, I left about an 1/8" flange at the bottom which kept it in shape. I then tinned both the top of the tank and the new neck. I used the typical acid plumbing flux and 50/50 solder with a good size soldering iron. Great find and idea for a not so easy to remedy common problem. If Moderators are watching this thread should be moved to Instructional threads and videos or pinned here so everyone can see it and benefit from it. I'm looking for this fill neck and wondered if you found the info on where to get them. Thanks. I sent an email to this company asking the heigth of there 1-3/4" neck. I will update this thread with what I find out. I need one for my Suburban project. @formariz would you hold one of yours for me while I check if this vendor has the correct height ones that will work for everyone! Its not that one. I have to find it. I have here somewhere their catalogue. I will have one for you if you need it. I used the style that was on the 603/633/704 gas tank. 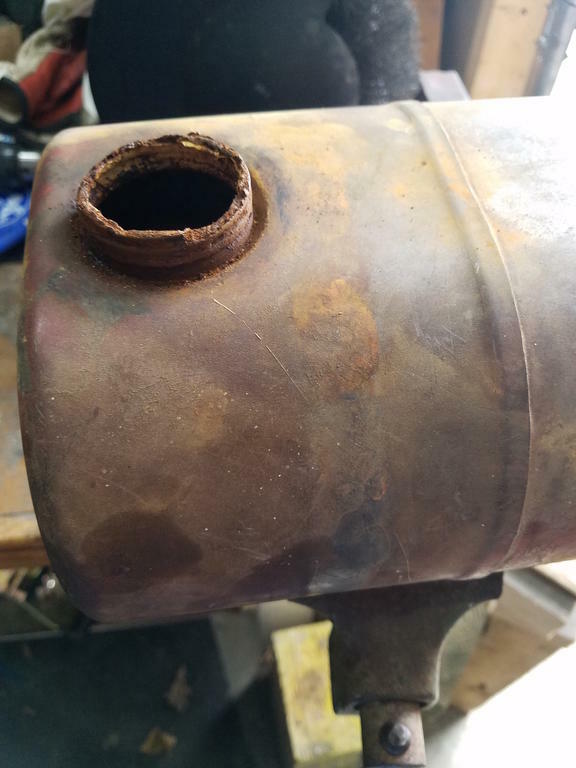 I bought mine from Filler Neck Supply, Inc. in Washington State. They were about $4.50 if I recall correctly. They may make the kind formariz used but I do not recall seeing them on their webpages. Here are photos of the ones I used. Two of these tanks have the extended neck. They work great on the RJ hoods. Finally located where I obtained the 1-3/4" tank necks and caps from .